Israel has reopened two vital border crossings between the occupied territories and the blockaded Gaza Strip, about a week after it closed them amid escalating tensions with Palestinians in the enclave. A spokeswoman for the Israeli ministry of military affairs, the unit that oversees the crossings said that the Erez crossing, for people, and the Kerem Shalom crossing, for goods, were reopened on Sunday morning. They had been closed last Monday, when the Tel Aviv regime launched multiple strikes against Hamas positions in Gaza, following a purported rocket attack that reached deep into occupied territories. 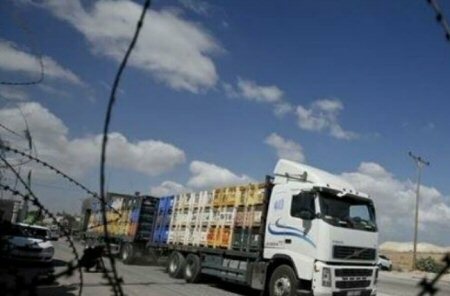 The Kerem Shalom land crossing, between the southern Gaza Strip and the occupied territories, is the main export-import terminal for the inhabitants of the region. The Erez crossing is situated at the northern end of the Gaza Strip. It indirectly links Gaza with the occupied West Bank. The reopening also comes after thousands of Palestinians protested along the Gaza border with Israel, on Saturday, marking the one-year anniversary of the Great March of Return and the Palestinian Land Day. Four Palestinians were killed during the latest protests. More than 260 Palestinians have been killed and about 26,000 others injured, by Israeli forces, ever since the Great March of Return protest rallies began in the Gaza Strip, on March 30, 2018, PNN further reports. Palestinians want an end to the Israeli occupation of their lands. They also demand the return of the Palestinian refugees to their homeland. The Gaza clashes reached their peak on May 14 of last year, which coincided with the US embassy relocation from Tel Aviv to the occupied East Jerusalem al-Quds. Gaza has been under Israeli siege since June of 2007, which has caused a decline in living standards. Israel has launched three major wars against the enclave since 2008, killing thousands of Gazans and shattering the impoverished territory’s already poor infrastructure.